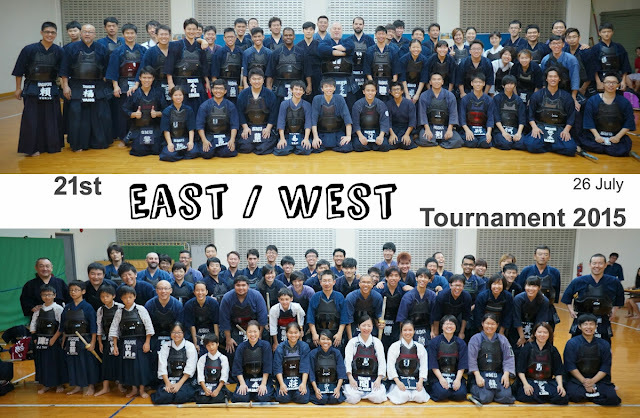 The 21st Singapore East-West Kendo Tournament will be held on the 26th of July 2015 at the Changi Japanese School Dojo. Please download the form here and submit your application form to the collection points at each SKC training venue. The closing date will be 15 July, by 9.15pm. The East-West Tournament will divide all players between two factions, East and West, and pit teams of five against each other. A second portion of the tournament will comprise of a long-team battle, where each member will try to secure a win for their team in order to ensure overall victory for their faction. This is the only tournament in the year where all affiliates are mixed up into varied teams, and the ladies may also get to battle the men! We invite everyone, regardless of grade or citizenship, to take part.